Germany center MARCEL GOC (57), the experienced 29-year-old veteran who totaled nine goals and 19 points in 42 National Hockey League games for the Florida Panthers this season, shields the puck from Austria center DAVID SCHULLER (45) of AC Klagenfurt during border battle that was the IIHF World Championships – Group H contest at the Hartwall Arena in Helsinki, Finland. Faultless penalty-killing and a late second period goal scored following a sensational solo rush from center ice allowed previously winless GERMANY to post a 2-0 shutout victory over traditional Alpine arch-rival AUSTRIA in a critical Group H contest at the 2013 IIHF World Championships. Austria trainer EMANUEL VIVEIROS, the well-traveled native Canadian who skated 29 National Hockey League games for the Minnesota North Stars before embarking on a long career in Europe, made very few changes to the squad that punched its ticket to the XXII Winter Olympic Games by winning the Group E Qualification Tournament held in Germany just a few short months ago. Indeed, fifteen of the very same Austrian skaters as well as the stubborn starting goaltender who had collectively held out for the necessary draw at the end of regulation time against Deutschland at the EgeTrans Arena in Bietigheim-Bissingen also returned to face-off with the Germans in Helsinki. Furthermore, adding scoring power to the Oesterreich side was none other than THOMAS VANEK, the star left wing who totaled 20 goals and 41 points in 38 NHL games for the Buffalo Sabres this season. Meanwhile, Deutschland trainer PAT CORTINA, in direct contrast, replaced eleven of the twenty German skaters who could only triumph against the Austrians in Bietigheim-Bissingen after extra time had been played; freshly arrived in Finland from North America and ready for to make his debut at his year’s IIHF World Championships opposite Oesterreich at the Hartwall Arena was Germany national team veteran JUSTIN KRUEGER, the 26-year-old defenseman from the Charlotte Checkers of the American Hockey League. Austria star left wing THOMAS VANEK (26), the 29-year-old University of Minnesota product who has scored 250 goals in 585 career games skating for the Buffalo Sabres in the vanunted National Hockey League, is shadowed by Germany defenseman JENS BAXMANN (15) of Detusche Eishockey Liga champion Eisbaeren Berlin during the IIHF World Championships – Group H contest at the Hartwall Arena in Helsinki, Finland. Unlike the pivotal Olympic qualifier at Bietigheim-Bissingen where the Germans decisively outshot the Austrians 35-19 in regulation time, the opening period at the Hartwall Arena in Helsinki was a wide-open, back-and-forth affair with both teams combining to generate an almost evenly divided twenty-six shots. Oesterreich had the best opportunity of the opening period when the Germans saw left wing YANNIC SEIDENBERG of Adler Mannheim and NHL-Star CHRISTIAN EHRHOFF of the Buffalo Sabres both sitting in the penalty box at the same time. The Austrian captain THOMAS KOCH of AC Klagenfurt had a glorious chance at the right side of the net near the end of the two-man advantage but Germany goaltender ROB ZEPP stretched out his left leg just in the nick of time. The NHL goal-shark Vanek took his chance with the rebound but was denied by the native Canadian who has now won five Deutsche Eishockey Liga titles in six seasons with Eisbaeren Berlin. Austria started the second period on the power play after veteran Germany center CHRISTOPH ULLMANN of Adler Mannheim was assessed a slashing minor at the 20:00 mark of the match. The impotent Austrians also skated with the man-advantage for a fourth time in succession after Germany defenseman FRANK HOERDLER of Eisbaeren Berlin was caught hooking with little more than four minutes having expired in the second session. But Zepp, who was starting no less than his third international contest for Germany against the neighboring arch-rivals from Austria on this 2012/13 campaign, was not about to concede on this day. It was a fine way for the resilient German netminder to rebound from his own personal debacle in the preceding IIHF World Championships contest against Slovakia, to be certain. Germany center PATRICK HAGER (50) of ERC Ingolstadt, the 24-year-old former Rosenheim Star Bulls and Krefeld Pinguine attacker who notched the game-winning goal for Deutschland against Oesterreich at the Albert Schultz Halle in Vienna this past September in the third period of the so-called “Jubilaeum Laenderspiel” staged in conjunction with the 100th anniversary celebration of the Austrian Ice Hockey Federation. It was not until center DAVID SCHULLER of AC Klagenfurt was sent to the penalty box for holding just one minute past the halfway point of this Group H match at the Hartwall Arena in Helsinki that the Austrians, themselves, were finally forced to skate shorthanded. Germany’s new captain Ehrhoff put three of his game-high four shots on target in the second period but was denied each time by in-form Austria goaltender BERNHARD STARKBAUM of Swedish Elitserien club Mo Do Ornskoldsvik; as for Deutschland center MARCUS KINK, it was his third shot of the contest which proved to be the charm that broke a German scoring drought against stingy Austria at the annual IIHF World Championships that had been approaching a full decade, itself. The 28-year-old Adler Mannheim attacker picked up a loose puck in center ice and breezed past one player in the netural zone. After crossing the blue line, the ambitious Kink knifed right through two Austria defenders and burst in on net all alone. A simple wrist shot was all it took for Germany to break the scoreless deadlock precisely at the 17:00 mark of the second period. 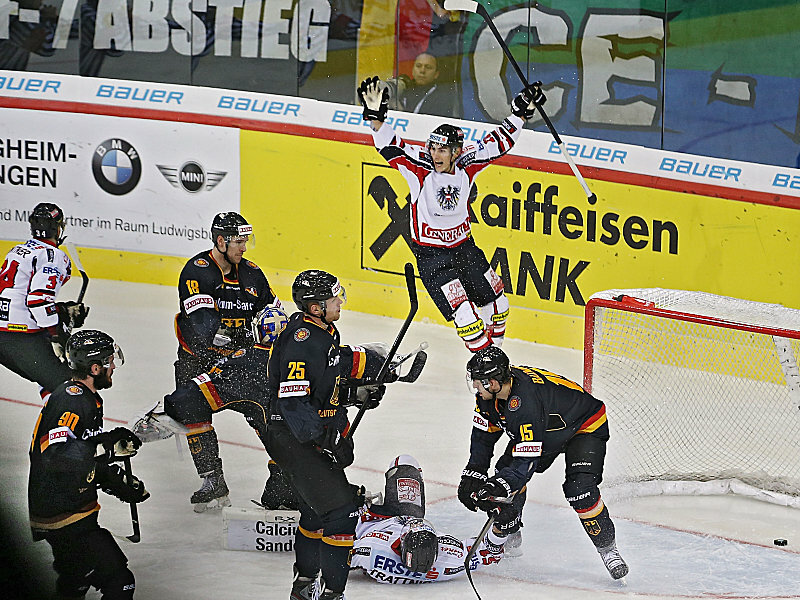 Kink’s third career goal for Deutschland at a major international tournament ended a negative streak for Germany of having not scored a goal against Austria at the annual IIHF World Championships for an astonishing 140 minutes and 50 seconds. That, to put things in perspective further, is the equivalent of two complete games plus just a little over another entire period. Germany national team veteran ALEXANDER BARTA, the teammate of the Austrian netminder Starkbaum with Swedish side Mo Do Ornskoldsvik this past season who was among those dropped by the trainer Cortina after the Olympic qualification disaster, was the last player to score a goal for Deutschland against Oesterreich at the IIHF World Championships (in the first period of the 2-2 draw with the Austrians at the 2005 edition in Vienna). Germany’s work was not done, however, as Zepp, himself, picked up two minutes for tripping with only six seconds to play until the second intermission. 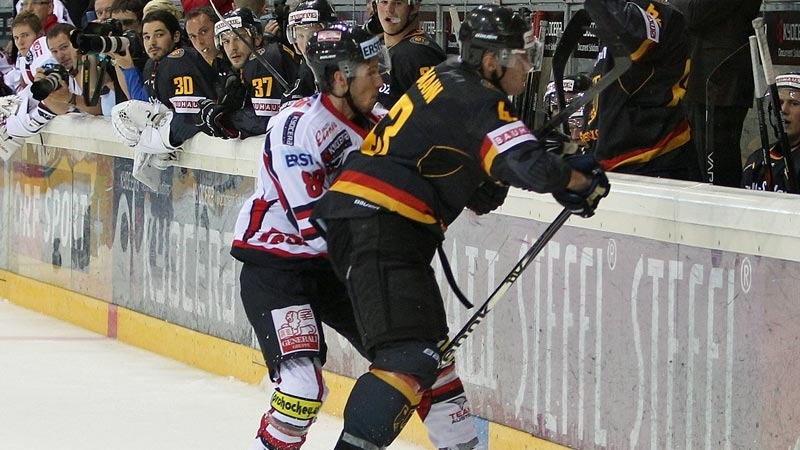 But Cortina’s charges were successfully able to kill off that penalty as well as the holding infraction that was whistled on Koelner Haie right wing FELIX SCHUETZ roughly eight minutes into the third period. In fact, the Germans did not just shut down the opposing power play but, indeed, short-circuited the entire Austrian attack throughout virtually the whole final frame. There would be no repeat of events in Bietigheim-Bissingen, where the Germans, in a fateful third period of play, had tragically failed to protect what had already been gained. Clearly having learned that painful lesson, Germany went on to dominate possession while outshooting Austria 11-3 in the last twenty minutes at the Hartwall Arena. 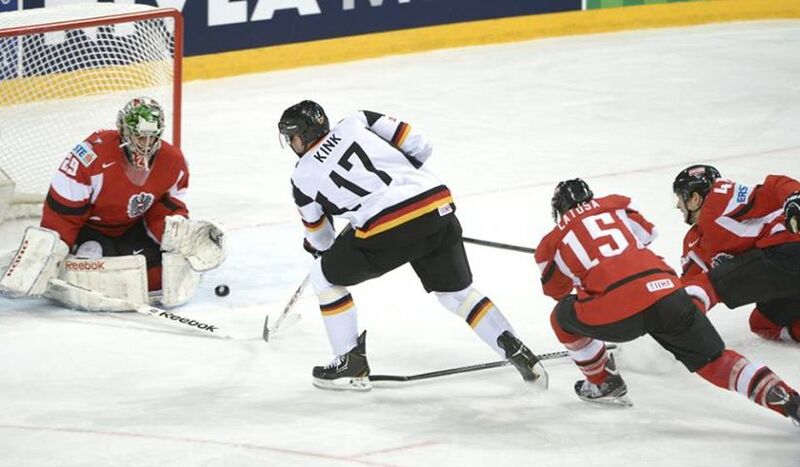 There was one last power play to be dealt with after Germany defenseman TORSTEN ANKERT of Koelner Haie, the 24-year-old rearguard who is appearing at a major international tournament for the very first time ever, was boxed for interference at the 58:28 mark of the match. Not surprisingly, the Oesterreich trainer Viveiros used the occasion to exchange the goaltender Starkbaum with an extra attacker in order to provide the trailing Austrians with what amounted to another two-man advantage on the power play. The NHL star Vanek had one last big chance and boomed a slapshot shot from the left face-off circle but the Buffalo Sabres winger was denied by the determined Zepp, who originally spent four years playing professional hockey in North America but passed almost all of that time with the Florida Everblades in the lower level East Coast Hockey League. Kink was awarded his second goal of the game after stealing the puck from Vanek in the neutral zone just outside the Austrian blue line. The influential native of Duesseldorf, who netted only 11 goals after 67 games in all competitions this term for Adler Mannheim, missed his attempt at the wide open net but had been ruthlessly chopped down in the process by the obviously frustrated defenseman THOMAS POCK, the 31-year-old University of Massachusetts – Amherst product who skated this past season with the Lake Erie Monsters in the American Hockey League. It was an open and shut case for a penalty shot, which was, with Oesterreich having already pulled its goaltender, simply awarded to the Germany center by the match referees. Germany goaltender ROB ZEPP (72) of Deutsche Eishockey Liga champion Eisbaeren Berlin focuses on the puck with lethal Austria star left wing THOMAS VANEK (26) of the NHL’s Buffalo Sabres lurking on the doorstep during the Alpine border battle that was the IIHF World Championships Group H tussle at the Hartwall Arena in Helsinki, Finland. NOTES — Germany captain CHRISTIAN EHRHOFF led all skaters with 26:08 of ice time while his constituent in the National Hockey League with the Buffalo Sabres, Austria left wing THOMAS VANEK, was the next most utilized on either side with 23:13 of ice time … Germany defenseman FRANK HOERDLER of Eisbaeren Berlin logged 19:18 of ice time while NHL legionnaire MARCEL GOC of the Florida Panthers, with 16:50 of ice time, skated the most among all Deutschland forwards. “It’s definitely nice to beat Austria. It’s never easy. They did find a way to steal the Olympics from us. 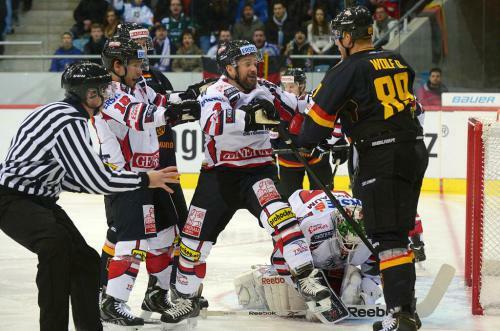 So it’s not really much revenge, because they’re still going to the Olympics,” stated Germany national team right wing JOHN TRIPP of Koelner Haie, the 36-year-old NHL veteran who represented Deutschland at the Winter Olympic Games hosted by his native Canada in 2010. Germany goal-scoring hero MARCUS KINK of Adler Mannheim along with left wing MICHAEL RAFFL of Swedish second division club IF Leksands, the developing 24-year-old who led Austria with five shots on target in the contest, were selected as the Players of the Game. The very first Eishockey-Laenderspiel between DEUTSCHLAND (Germany) and OESTERREICH (Austria), the neighboring rivals with the common language, was contested over a century ago in Prague on March 12, 1912. A little over ten months after the Germans defeated the Austrians 4-1 in what was then Bohemia, the two countries met yet again for the first time ever at a major international ice hockey tournament. There in Munich, on January 27, 1913, the bronze medal-winning hosts hammered the Austrians 14-4 during the third official edition of the IIHF European Championships. Austria improved rapidly, however, and powered, in part, by forward HERBERT BRUECK, the skilled EV Wien star who would later join contemporary German powerhouse Schlittschuh Club Berlin, won the IIHF Europoean Championships tournament in 1927. The Germans, led by the goal-scoring of SC Berlin legends RUDI BALL and GUSTAV JAENECKE, were crowned kings of Europe after finishing second at the first-ever IIHF World Championships in 1930 while the Austrians celebrated their second European title every bit as much as the bronze medal earned at the 1931 IIHF World Championships in Poland. Deutschland repeated as European champions at the 1934 IIHF World Championships even though it was Austria who defeated their Alpine adversaries from Germany in Milan that year. Prior to its dissolution of the former Deutsche Demokratische Republik (German Democratic Republic or East Germany), the Bundesrepublik Deutschland (Federal Republic of Germany) never lost a major international tournament game to the Alpine adversaries from Austria. Since the reunification of Germany, the Austrians have now lost six of eight major international matches to its traditional arch-enemy on ice but that record, of course, does not include the famous “Eishockey Cordoba” of this past February, the result which will prevent the Germans from skating in the men’s ice hockey tournament at the XXII Winter Olympic Games in Russia next year. 2 x 24 = Austria defenseman FLORIAN IBERER (left) of AC Klagenfurt and Germany right wing ANDRE RANKEL of Eisbaeren Berlin chase after a loose puck in the corner as netminder BERNHARD STARKBAUM (29) of Swedish elite league side Mo Do Ornskoldsvik keeps a sharp on events during the tense and dramatic final contest of the XXII Winter Olympic Games – Group D Qualification Tournament at the sold-out TransEge Arena in Bietigheim-Bissingen. After falling behind twice in a border clash it could not afford to lose in regulation time, the visitors rallied to equalize with roughly seven and a half minutes to play before repelling a few final assaults as a determined AUSTRIA held GERMANY at the end of three periods and, in the process, picked up the valuable point it needed to win the XXII Winter Olympic Games – Group D Qualification Tournament in Bietigheim-Bissingen. The result means that there will be no team from Germany skating in the men’s ice hockey tournament since the 1948 Winter Olympic Games were hosted by St. Moritz in Switzerland. Indeed, by losing the decisive qualification match at home to the neighboring arch-rivals from Austria, the Germans saw their impressive record of 16 consecutive appearances at the premier competition of the Winter Olympics abruptly snapped. But, after outshooting both Italy (36-20) and Austria (35-19) by substantial margins in regulation time, Germany have only themselves to blame for the history-making failure. Austria, meanwhile, justifiably celebrated what surely must rank as the most spectacular and significant triumph for the national ice hockey team ever. In fact, the Austrian newspapers proudly compared this magnificent victory at Bietigheim-Bissingen to the national soccer team’s famous 3-2 win over West Germany at the 1978 FIFA World Cup final tournament held in Argentina. Even national hero HANS KRANKL, the retired star striker who had scored two goals for the Austrians in the memorable triumph over the defending World Cup champions in South America, publically commented on what was hailed as the “EISHOCKEY CORDOBA”. Germany defenseman BENEDIKT KOHL (34) of Wolfsburg Grizzly Adams redirects the puck past Austria netminder BERNHARD STARKBAUM of Swedish Elitserien side Mo Do Ornskoldsvik to score the first goal of the decisive XXII Winter Olympic Games – Group D Qualification Tournament contest at the TransEge Arena in Bietigheim-Bissingen. After applying twice as much pressure as their guests in the first period, Germany finally broke a scoreless deadlock with 1:19 to play until the first intermission. With veteran Austria defenseman ROBERT LUKAS of of EHC Black Wings Linz sitting in the penalty box for holding, Wolfsburg Grizzly Adams defenseman BENEDIKT KOHL snuck down low to the side of the net and skillfully redirected the straightaway point shot of Eisbaeren Berlin blueliner CONSTANTIN BRAUN for his very first goal in the national team colors. Germany might have doubled its advantage before the end of the period, but legionnaire ALEXANDER BARTA of Swedish elite league club BK Rogle Angelholm was stopped on the breakaway by Austria goaltender BERNHARD STARKBAUM, the 26-year-old who also plays in Sweden’s Elitserien with Mo Do Ornskoldsvik. Aided by still three more power play opportunities, the Germans stepped up their attack in the second period only to be turned constantly away by the strong work of Starkbaum and the veteran Austria defensive corps. Even more to the dismay of the decidedly partisan crowd at the sold-out TransEge Arena in Bietigheim-Bissingen, the visitors hauled themselves level in the middle session, as well. 33-year-old veteran defenseman ANDRE LAKOS, the former third round choice (# 95 overall) of the New Jersey Devils at the 1999 National Hockey League Draft who spent three seasons in the American Hockey League skating for the Albany River Rats, picked up a puck off the boards and blasted home from long range at the right point. Germany goaltender ROB ZEPP of Eisbaeren Berlin, a surprise starter in the opinion of some for this most imperative match with neighboring Austria, was not screened and appeared to have good look at the shot from Lakos but was effectively beaten to the short side; Adler Mannheim netminder DENNIS ENDRAS, the 27-year-old who appeared in 18 games for Deutschland at the last three annual IIHF World Championships, was not selected by first-year national team trainer PAT CORTINA in the wake of the unexpected overtime loss to Italy a couple of days earlier. Austria defenseman ANDRE LAKOS (64), the well-traveled veteran of the Swedish and Russian elite leagues who appeared in 27 Deutsche Eishockey Liga contests (2 go, 14 pts) for German club Koelner Haie before transferring to UPC Vienna Capitals in late January of 2012, receives congratulations after scoring a massive second period goal during the pivotal XXII Winter Olympic Games – Group D Qualification Tournament contest at the jampacked TransEge Arena in Bietigheim-Bissingen. Almost seven minutes into the third period, the Germans regained the lead after Austria captain THOMAS KOCH of AC Klagenfurt was sent off for holding. Skating with the puck behind the net, Barta made a brilliant play to spot the goaltender Starkbaum moving and find Germany captain MICHAEL WOLF of Iserlohn Roosters with a clever pass. Wolf’s sharp-angle shot bounced in off Starkbaum and seemed to give the home side a great lift, as did yet another to holding penalty shortly thereafter. But Germany never did cash in on the holding penalty issued to Austria defenseman MARTIN SCHUMNIG, also of AC Klagenfurt, and Cortina’s charges would come to regret that soon enough. This particularly after Austria veteran left wing MARKUS PEINTNER of SV Villach charged into the offensive zone and wristed a shot from the left faceoff circle that, once again, beat the German goaltender Zepp to the short side. Aware of the situation coming into the final Olympic qualifying match at the TransEge Arena, the Austrians were immediately overcome with joy but, realizing that a good seven and half minutes remained to be contested, quickly regained their composure. The presence of four veteran international defenseman who had been on the last Austrian team to have appeared at the Winter Olympic Games must have helped greatly in settling the younger players down for the stretch run at Bietigheim-Bissingen. Disappointed German defenders reflect upon very recent events as Austria’s colorful right wing MARKUS PEINTNER (34) of VSV Villach wheels away after scoring the equalizing goal that will ultimately earn die Oesterreicher a ticket to Sochi, Russia, during the third period of the critical XXII Winter Olympic Games – Group D Qualification Tournament D contest at the sold-out TransEge Arena in Bietigheim-Bissingen. The national ice hockey squad of AUSTRIA has been trained by former National Hockey League defenseman EMMANUEL “Manny” VIVEIROS since the start of the 2009/10 campaign. The 47-year-old native of St. Albert in the western Canadian provice of Alberta was originally chosen in the sixth round of the 1984 National Hockey League Draft by the then-powerhouse Edmonton Oilers and later skated in 29 NHL games (1 go, 12 pts) over parts of three seasons with the Minnesota North Stars. After sixteen years on the blueline for professional hockey clubs in Austria, Germany as well as Italy, the well-traveled Viveiros became trainer of Austrian club AC Klagenfurt roughly twelve months after hanging up his skates for good at the end of the 2006/07 season. After attaining the proper citizenship papers, Viveiros appeared in five contests (0 go, 2 as) as a naturalized Oesterreicher with the home side at the 2005 IIHF World Championships co-hosted by Innsbruck and Vienna. Note … 24-year-old left wing MARTIN ULMER, now skating in Switzerland’s elite Nationalliga A, started this 2012/13 campaign in the Swiss Nationalliga B with HC Lausanne (9 ga, 3 go, 7 pts) and also spent considerable time with HC Red Ice Martigny-Verbier-Entremont (28 ga, 8 go, 27 pts), as well, before moving on to EHC Biel-Bienne. Note … 30-year-old defenseman FLORIAN IBERER began this season skating in the Swedish Allsvenskan (second division) for IF Troja-Ljungby (25 ga, 3 go, 9 pts) before returning to Austria in the middle of December. Austria goaltender BERNARD STARKBAUM of Swedish elite league side Mo Do Ornskoldsvik effectively smothers the puck as aging defenseman GERHARD UNTERLUGGAUER, the 36-year-old veteran who had two seasons of Canadian junior hockey with the Brandon Wheat Kings many moons ago, and Germany’s good-sized left wing DAVID WOLF (89) of Hamburg Freezers joust during the tense XXII Winter Olympic Games – Group D Qualification Tournament decider at the sold-out TransEge Arena in Bietigheim-Bissingen, Germany. The 2011 IIHF World Championships co-hosted by Slovakian cities of Bratislava and Kosice was the last major international tournament that that national team of Austria appeared at. The 2002 Winter Games at Salt Lake City in the United States was the last occasion on which Austria qualified for the men’s ice hockey tournament at the Olympics. Four players on Austria’s 23-man roster at the Olympic qualification tournament in Bietigheim-Bissingen, the defensemen ANDRE LAKOS, ROBERT LUKAS, MATTHIAS TRATTNIG and GERHARD UNTERLUGGAUER, were also on the last Austrian squad that skated at the Olympics. SV Villach left wing MARKUS PEINTER, he of the distinctive handlebar moustache and accompanying beard, wrote his name into national team history books by scoring the all-important third period goal against host Germany at the sold-out TransEge Arena in Bietigheim-Bissingen that provided Austria with a ticket to the men’s ice hockey tournament at the XXII Winter Olympic Games to be held next year in Soschi, Russia. Germany’s offensive-minded defenseman CHRISTIAN EHRHOFF (10) of the Buffalo Sabres had already appeared in more than 550 National Hockey League contests before joining the Krefeld Pinguine (32 ga, 8 go, 26 pts) of the Deutsche Eishockey Liga early this past September. As the “Lock-Out” situation in the National Hockey League dragged on after Christmas, it was beginning to look more and more likely that the NHL players for both AUSTRIA and neighboring arch-rival GERMANY might, indeed, be able to participate at the upcoming qualfication tournament for the right to appear at the men’s ice hockey tournament of the XXII Winter Olympic Games to be held next year in Soschi, Russia. Shortly after the New Year arrived, however, the labor strife was finally resolved and all the NHL players biding their time in both the Deutsche Eishockey Liga as well as the Erste Bank Eishockey Liga immediately returned to North America. It is interesting to note that, by the time of the actual Olympic qualification tournament in Bietigheim-Bissingen, the Austrian star left wing THOMAS VANEK of the Buffalo Sabres had already established himself as the leading scorer in all the National Hockey League for this strike-shortened 2013 season. Ehrhoff, Hecht and Seidenberg have all appeared at the Winter Olympic Games on three occasions each while Goc, Gress and Sulzer are all two-time Olympic performers. Holzer was a member of the German contingent that did not fare so well at the last Winter Olympic Games host by the western Canadian city of Vancouver in 2010. Krueger, the former Cornell University rearguard who is the son of Edmonton Oilers head coach RALPH KRUEGER, has skated with the German national team at the last three annual IIHF World Championships (23 ga, 1 go 3 pts). Buffalo Sabres’ Austria international THOMAS VANEK (26), the lethal left wing who won an NCAA title at the University of Minnesota before twice topping the 40-goal plateau in the National Hockey League, backhands the puck past the Boston Bruins’ Finnish goaltender TUUKA RASK (40) during the recent NHL contest that saw Vanek register five points in a single game for the second time this strike-shortened season already. The one Austrian player currently skating in the American Hockey League is veteran THOMAS POCK, the former University of Massachusetts – Amherst defenseman who skated 118 NHL games (8 go, 17 pts) for the New York Rangers and New York Islanders before spending time in both Switzerland as well as Sweden. The experienced 31-year-old was a member of the last Austrian national team that appeared at the Winter Olympics having skated four games (0 go, 0 pts) at the 2002 Salt Lake City Games held in the western part of the United States. Overall, Pock has represented Austria at five major international tournaments (25 ga, 2 go, 4 pts) thus far in his career. Austria left wing MICHAEL GRABNER (17), the 25-year-old who totaled 20 goals and 32 points in 78 NHL games for the New York Islanders last season, was the only National Hockey League player on the squad of national team trainer Emmanuel Viveiros at last spring’s 2012 IIHF World Championships – Division 1 Group A tournament hosted by Ljubljana, Slovenia. Two goals from THOMAS KOCH of AC Klagenfurt and a third strike of the compeition from DANIEL OBERKOFLER of EHC Black Wings Linz highlighted a five-goal outburst in the first period while solid defensive play took care of the rest as AUSTRIA romped to an easy 6-1 victory over HOLLAND for a second straight triumph at the XXII Winter Olympic Games – Group D Qualfication Tournament in neighboring Germany. Koch, the 29-year-veteran who has represented Austria at the highest level of the annual IIHF World Championships on five occasions (30 ga, 7 go, 15 pts) in his career, opened the scoring with a goal five and half minutes into the game and added an assist on the power play strike by left wing MICHAEL RAFFL of Swedish second division club IK Leksand less than three minutes later. 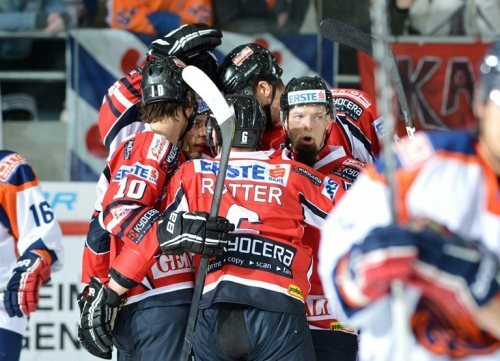 Michael’s brother THOMAS RAFFL of EHC Red Bull Salzburg, the 26-year-old winger who had a season and a half in the Swedish Elitserien before returning to Austria in late November of 2010, tacked on yet another goal just forty-five seconds later and forced the shell-shocked Dutch to call for a time out. This tactic from Holland’s imported American trainer BARRY SMITH, the native of Michigan who also doubles as head coach of Tilburg Trappers in the Netherlands’ top flight, failed to settle his squad down, however. Austria left wing MICHAEL RAFFL (12), the developing 24-year-old who has totaled 22 goals and 45 points in 43 Swedish Allsvenskan contests for IK Leksands this term, lifts the puck over outstretched Holland goaltender IAN MEIERDRES of Tilburg Trappers to net a first period power play goal during the XXII Winter Olympic Games – Group D Qualification Tournament at the EgeTrans Arena in Bietigheim-Bissingen, Germany. Oberkofler, the two-goal hero of the opening day triumph over Italy twenty-four hours earlier, notched a fourth goal for Austria at the 14:27 mark of the first period. Koch, meanwhile, added his second goal of the Olympic qualifying match against Holland with a little over two minutes to skate before the first intermission. Having allowed five goals on just thirteen Austrian shots, Holland’s starting netminder IAN MEIERDRES of Tilburg Trappers was benched at the break by his club trainer Smith in favor of understudy MARTIN OOSTERWIJK, the 22-year-old from the Friesland Flyers. Oosterwijk permitted a second period goal by Austria’s highly experienced veteran MATHIAS TRATTNIG, the 33-year-old former University of Maine defenseman who was a fourth round NHL draft pick (1998, # 94 overall) of the Chicago Black Hawks and has appeared at 11 major international tournaments (64 ga, 7 go, 19 pts) in his career, but, overall, turned aside 24 of 25 shots the rest of the way while finally stabilizing the battered Dutch ship. The Austrians greeted Oosterwijk by piling up a lopsided 18-4 margin in the shots-on-goal department but, ultimately, called off the dogs in the final period of play. The Netherlands was rewarded for its never-say-die attitude when MITCH BRUIJSTEN of Eaters Geleen, the 23-year-old right wing who just spent the last three seasons playing NCAA hockey with the University of Alaska – Anchorage, scored a late consolation goal on the power play with a little less than two minutes to play in Bietigheim-Bissingen. Austria center DAVID SCHULLER (45) of AC Klagenfurt, the 31-year-old veteran who has appeared at the elite level of the annual IIHF World Championships on three occasions (18 ga, 0 go, 1 as) in his career, tangles with Holland left wing RAPHAEL JOLY (8) of HYS Den Haag during the XXII Winter Olympic Games – Group D Qualification Tournament contest watched by the healthy crowdy of 4,150 spectators at the modest EgeTrans Arena in Bietigheim-Bissingen, Germany. Austria goaltender BERNHARD STARKBAUM, the 26-year-old former SV Villach shot-stopper who is enjoying a productive first season with Mo Do Ornskoldsvik (37 ga, 2.12 avg, .933 svpct) in the Swedish top flight, keeps a sharp eye on events as Italy’s 2006 Olympic veteran GIULIO SCANDELLA of Swedish second division club IK Oskarshamn, the 29-year-old native Canadian winger who has already skated at five major international tournaments (26 ga, 3 go, 10 pts) in his career, stretches to control a loose puck during the initial contest of the XXII Winter Olympic Games – Group D Qualifcation Tournament at the EgeTrans Arena in Bietigheim-Bissingen, Germany. Two goals from center DANIEL OBERKOFLER of EHC Black Wings Linz combined with 36 saves from netminder BERNHARD STARKBAUM of Swedish elite league club Mo Do Ornskoldsvik enabled defensive-minded AUSTRIA to hold off late-charging ITAY for an important 3-2 triumph in the opening match of the XXII Winter Olympic Games – Group D Qualfication Tournament in Bietigheim-Bissingen, Germany. The Austrians grabbed a goal on the power play when Oberkofler netted just six minutes into the Olympic qualfiying match with the neighboring Alpine rivals and added a second after winger GREGOR BAUMGARTNER of EHC Black Wings Linz, the 33-year-old veteran who was originally selected by the Montreal Canadiens in the second round (# 37 overall) of the 1997 National Hockey League Draft but never advanced past the American Hockey League level, scored with a little less than three minutes to skate until the first intermssion. ANTON BERNARD of HC Bolzano halved the deficit and finally put Italy on the scoreboard with a power play strike at the the 13:42 mark of the second period. Less than three minutes later, Oberkofler restored the two-goal advantage with his second tally of the contest. But the Austrians, who generated just seven shots on target in the final forty minutes, were forced to hang on for dear life after the Italians got a goal from native Canadian VINCE ROCCO of HC Alleghe, the 25-year-old right wing who skated in seven East Coast Hockey League games (4 go, 9 pts) for the Reading Royals after completing his NCAA career at the University of Niagara in the spring of 2009, with roughly ten minutes remaining in the match. Austria center DANIEL OBERKOFLER (10) of EHC Black Wings Linz raises his stick after beating Italy netminder DANIEL BELLISSIMO of Swedish elite league side IK Timra, the 28-year-old native of Toronto and former Western Michigan University shot-stopper, to score the very first goal of the XXII Winter Olympic Games Group D Qualficiation Tournament six minutes into the competition’s opening match at the EgeTrans Arena in Bietigheim-Bissingen, Germany. 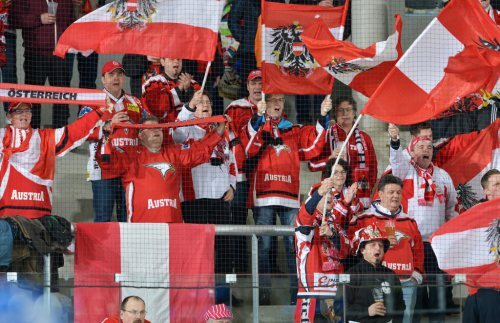 Having seen their national team successfully complete a pivotal first step towards qualifcation for men’s ice hockey tournament at the XXII Winter Olympic Games to be held in Sochi, Russia, next year, supporters of Austria sing loudly after defeating stubborn neighbor Italy at the two-thirds full EgeTrans Arena in Bietigheim-Bissingen, Germany. Austria center THOMAS RAFFL (5) of EC Red Bull Salzburg and his constituent in the Erste Bank Eishockey Liga, defenseman MATTHIAS TRATTNIG (51), join forces to separate Germany forward DANIEL PIETTA (86) of Krefeld Pinguine, the 25-year-old left wing who appeared in four contests but had no points for Deutschland at the 2012 IIHF World Championships in Scandinavia this past spring, from the puck during the festive JUBILAEUMS-LAENDERSPIEL match at the Albert Schultz Halle in Vienna. The visiting neighbors were able to stage a third period rally despite their interim coaching staff and inexperienced roster of players as experimental GERMANY edged host AUSTRIA 4-3 in this “JUBILAEUMS-LAENDERSPIEL” celebrating the 100th anniversary of the ice hockey federation in Oesterreich. Hamburg Freezers’ bullying left wing DAVID WOLF, the 23-year-old who piled up 12 goals and 167 penalty minutes in the Deutsche Eishockey League last term, gave the Germans the initial go-ahead goal only ten minutes in but the Austrians, however, were able to level thanks to veteran GREGOR BAUMGARTNER of EHC Linz, the 33-year-old journeyman left wing who was once chosen by the famed Montreal Canadiens in the second round (# 37 overall) of the 1997 National Hockey League Draft, with just 23 seconds left in the first period. The Austrians looked to have seized control of the contest shortly after both teams changed goaltenders midway through the second period. EC Red Bull Salzburg left wing MANUEL LATUSA and MARKUS SCHLACHER of Vienna Capitals scored within 60 seconds of each other to send the hosts out in front by a pair of goals. But the national team improving under trainer EMMANUEL VIVEIROS, the native Canadian who skated 29 NHL games for the Minnesota North Stars before embarking on a lengthy European career which included stops in Germany and Italy as well as the long stay in Austria, could not hold its lead in front of 2,500 spectators at the Albert Schultz Halle in Vienna. Germany goaltender ROB ZEPP of Eisbaeren Berlin, the native of Canada who made two solid appearances for the host nation at the 2010 IIHF World Championships held in Germany, makes the save and takes a stick in the pads from Austria forward MANUEL LATSUA (15) of EC Red Bull Salzburg during the Jubilaeums-Laenderspiel at the Albert Schultz Halle in Vienna. The Germans, who were directed behind the bench in this 100th Anniversary Match with Austria by the tandem of junior national team trainer ERNST HOEFNER and national team goaltending coach KLAUS MERK, came storming back in the final frame. 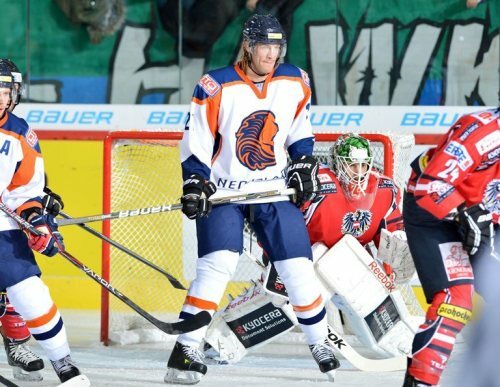 23-year-old center MARTIN BUCHWIESER of EHC Red Bull Munich halved the deficit with a shorthanded strike six minutes into the third period and then PATRICK HAGER, who recently transferred from Krefeld Pinguine to ERC Ingolstadt this summer, equalized with half the period remaining. Eisbaeren Berlin defenseman FRANK HOERDLER, who had represented Germany at the last five consecutive IIHF World Championships until dropped for the tournament in Scandinavia last spring by since-departed Swiss trainer Jakob Kolliker, became a match-winning hero for Deutschland with six minutes to play in the contest with Austria. Of course, both Austria and Germany are preparing for the massive showdown in the qualification tournament for the 2014 Winter Olympic Games. The two countries are, along with mutual Alpine neighbor Italy, drawn together in a final group that will be contested in Bietigheim-Bissingen, Germany, later this season in early February of 2013. Only one team can, then, advance to the Games of the XXII Winter Olympiad to be hosted by Sochi, Russia. One Austrian publication went so far as to ponder the labor unrest and “Lockout” situation currently prevailing in the National Hockey League on the other side of the Atlantic Ocean. Speculation focused on the availability of NHL players such THOMAS VANEK, the former University of Minnesota star left wing who has scored 230 goals in seven NHL seasons with the Buffalo Sabres, as well as winger MICHAEL GRABNER, the former first round NHL draft pick of the Vancouver Canucks who has scored 54 goals in the last two years with the New York Islanders, and ANDREAS NOEDL, the one-time Philadelphia Flyers winger who was traded to the Carolina Hurricanes last season, for the pivotal Olympic qualification tournament this upcoming February. Naturally, if Austria could have access to their NHL players, then that would mean Germany could suit up the likes of CHRISTIAN EHRHOFF, the $ 40.0 million dollar, offensive-minded defenseman of the Buffalo Sabres, and experienced DENNIS SEIDENBERG, the stay-at-home defender who was such a big part of the Boston Bruins’ Stanley Cup victory in 2011. Germany defenseman FELIX PETERMANN (43) of EHC Red Bull Munich, the 28-year-old rearguard who appeared in three contests for Deutschland at the 2007 IIHF World Championships hosted by Russia, is sent flying over the boards after a mighty collision with Austria forward RAPHAEL HERBURGER (89) of AC Klagenfurt right in front of the German bench during the Jubilaeum-Laenderspiel at the Albert Schultz Halle in Vienna. Austria winger MANUEL GEIER (88) of AC Klagenfurt is thwarted by substitute Germany goaltender JOCHEN REIMER (30) of EHC Red Bull Munich at the side of the net as backchecking MICHAEL WOLF (16), the 31-year-old Iserlohn Roosters right wing who had appeared at six consecutive major international tournaments for Deutschland (38 ga, 9 go, 17 pts) before being dropped for the annual IIHF World Championships last spring by by the short-lived Swiss trainer Jakob Kolliker, helps out during the Jubilaeum-Laenderspiel match at the Albert Schultz Halle in Vienna. ERC Ingolstadt center PATRICK HAGER (50), the 24-year-old who represented Germany at both the 2009 and 2010 IIHF World Championships, slips the puck past Austria goaltender RENE SWETTE of AC Klagenfurt to square the score at three goals apiece in the 50th minute of the Jubilaeum-Laenderspiel celebrating the 100th Anniversary of the Austria Ice Hockey Federation at the Albert Schultz Halle in Vienna.